Have you ever wanted to link a Youtube video to your mobile course? 1. First, locate the video you want to use from Youtube.com. 2. Click on the "Share" link below the video. 4. After opening up your mobile course in the authoring tool, double click on the default text in the mobile video file field to activate it. 5. Paste the link into the activated field. When you preview the course, you will be able to view the Youtube video playing from the video page in your course. 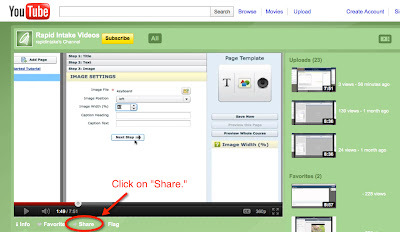 To learn how to embed a Youtube video to a Flash course, check out this post.